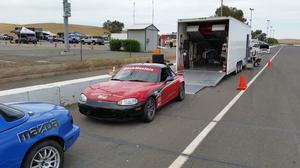 Below is a pic of a 1999 Federal (no Cat in header) Spec Miata built by Jason Hoover of Hooverspeed. This car was stolen along with the enclosed trailer and the truck that was used to haul it. Theft occured on Thursday, June 15th between 11pm and 11:45pm in Folsom, CA. This was my personal car but I had recently sold it to one of the TMR staff members. He had just loaded it for a trip to Laguna Seca, locked it up in front of his house at 11pm, and then came outside at 11:45pm and it was gone! Truck, Trailer, Car, New Wheels & Tires, and all of his tools. The Trailer was recovered a day later but it was guttted. No sign of the Miata or the Truck. 1. The front upper mount points for the hard top are flat plate actually welded into the upper corners of the cage. 4. The engine cooling fan has a red aircraft style switch on the center of the vertical guage console just in front of the shifter. 5. This is the most obvious feature that will ID this as the stolen car.... The cage has a lower left drivers leg padded panel attached to the roll cage main hoop down around ankle to shin level. This is padded to protect the drivers left leg on impact. It's probably about 11" long and 8" to 9" tall. 7. Car also had the external fuel pressure regulator in the trunk. Let's catch these jerks! Keep you eyes open for it on Craigslist. This was a beautiful and fast car and hopefully it can be found before some tweeker cuts it up and sells the parts for pennys on the dollar!